Nearly 500 previously unknown ocean species were discovered in the Kuril Basin, part of the Sea of Okhotsk in the north western Pacific Ocean in the summer of 2015. Scientists from Russia, Germany, Japan, Spain, and elsewhere took part in the SokhoBio expedition that made these sensational discoveries. RIR exclusively reports the preliminary results. Deep-water life in the Sea of Okhotsk was scarce and lacking diversity, scientists earlier believed. Previously, they knew of only 50 species in the Kuril Basin. Marina Malyutina, deputy head of the SokhoBio expedition told RIR that they found around 1,000 species there last summer, more than half of which were completely new for scientists. Most are similar to Antarctic and Atlantic deep-water species, and include single-celled organisms, crustaceans, mollusks, echinoderms, worms, and fish. Scientists were surprised by the similarity between species of deep-water fauna in the southeastern part of the Kuril Basin and that of the adjacent Pacific Ocean. "This is amazing because Pacific Ocean fauna is ancient, evolving in the course of millions of years," explained Malyutina. "The Far Eastern deep-water basins are relatively young and have a complex geological history, with periods of glaciation and complete isolation." Research was conducted at a depth of 3,500-6,000 metres, where there is no natural light and the pressure is 750 times higher than in the atmosphere. At these depths, the main inhabitants are a few millimetres in size, and are difficult to catch. 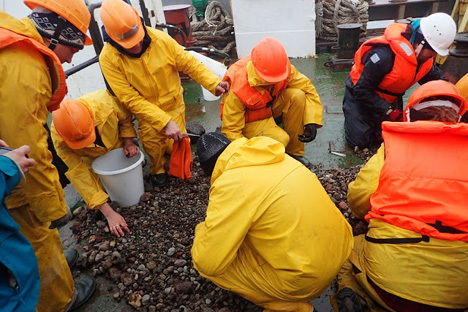 With the help of special equipment on board the Academic Lavrentiev research vessel, scientists made a rich catch, primarily sea organisms that are 1 mm to 10 mm long, as well as less than 1 mm. They also found larger creatures, including fish, that are more than 1 centimeter in length. "We were very impressed by the number of species at the deepest levels," said Angelika Brandt, professor of the Hamburg Zoological Museum and director of the German scientific group. "This was not expected, and in terms of the new species there were many interesting finds. For example, we found the deepest nemertean, or ribbon worms, ever reported, Cephalothrix iwatai." Scientists also came upon unknown genera and even a new family of creatures. The species still need to be studied at Russian, German and Japanese institutes, and scientists believe it may take years to give proper classification to the newly-discovered creatures. The first results of the study should be published in two years. A treasure trove of anti-tumor drugs and gold? In the future, researchers plan to isolate and extract certain natural substances from the collected specimens that could possibly be used to make medicines. Today, the Institute of Bio-organic Chemistry in Vladivostok prepares anti-inflammatory and anti-tumor drugs with biological additives from several sea organisms. Also, during a study of seabed soils near Simushir Island, geologists discovered specific iron-manganese formations, which indicates the region has gold and silver deposits. Scientists, however, will confirm this only after a complete study of the soil specimens. The SokhoBio expedition brought together researchers from the Zhirmunsk Institute of Sea Biology, the Ilichev Pacific Ocean Institute of Oceanology, the Hamburg Zoological Museum, the University of Bremen, the University of Tokyo, and other places. A fourth joint Russian-German expedition named Kuril-Kamchatka Biodiversity Studies II (KuramBio II) will take place in 2016 on board Germany’s new research ship, Sonne. It will study fauna at the Kuril-Kamchatka trench's maximum depths of 9,500 meters. This is just shy of the world’s deepest point, the Mariana Trench, which is 11,000 meters deep.